1. Prepare the vegetables - Preheat the oven to 180 Celsius. 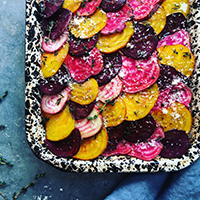 Using a sharp knife or a mandolin slice the beetroot and baby turnips into fine slices. 2. Add the double cream, milk and garlic to a saucepan and bring to the boil slowly on the lowest heat setting. 3. Prepare the daulpinoise - Grease a medium sized oven proof dish with the butter. Add a layer of turnip to the base of the dish, grate over a little nutmeg, sprinkle with a little of the parmesan and thyme and season well. Follow with a layer of beetroot, repeating the process and alternating the layers until all the ingredients are used up. Pour the double cream mixture into the dish. 4. Bake in the oven - Place in the oven for 50-60 minutes or until the vegetables are tender and cooked through.